Hearing loss is a common issue of older adulthood. 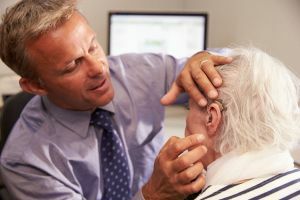 Even if it is only moderate hearing loss, this change in their functionality can dramatically change your aging loved one’s perspective on the world around them and their ability to maintain their independence. Helping them to keep up with the lifestyle that they desire and deserve and maintain as much of their independence as possible will support better mental and emotional health, ward off negative cognitive consequences, and improve their quality of life throughout their later years. • Encourage them to acknowledge it. One of the most challenging steps that many people must take when it comes to living with a challenge or limitation is actually admitting that change. It can be very hard for a person to come to terms with the reality that they are no longer as functional as they once were, or that they are no longer capable of handling certain aspects of their life in the way that they once did. This can stop your loved one from doing what they need to do to properly manage this loss and handle tasks effectively. • Look into hearing aids. Even mild to moderate hearing loss can make a tremendous difference in how your parent perceives and interacts with the world around them. Using a hearing aid can help them to better connect with the world and minimize the impact that this loss has on their ability to interact with the world. Today’ hearing aid technology is exceptionally precise as well as lightweight and easier to wear that older forms of the technology. Encourage your aging parent to visit their doctor to discuss their hearing loss and determine if a hearing aid is right for them. If they do start using these devices, support them in using them consistently for maximum benefit. • Start home health care. While it might seem as though adding another source of care to your parent’s life will diminish their independence, this is not the case with home health care. An in-home senior care services provider offers personalized care tailored to your loved one’s individual needs, challenges, and limitations in a way that encourages your senior to stay as active and engaged as possible as they age. This helps them to maintain their independence, find further meaning and excitement in their life, and take advantage of more of the opportunities that this new chapter in their life offers without them always having to rely on you to help them. • Use adaptive devices. A major component of independence is the feeling of being safe and secure in your home. Help your parent accomplish this aspect of their independence by installing adaptive devices in their home. Adaptive smoke detectors, carbon monoxide detectors, and doorbells all feature flashing lights in addition to sound to allow a person who is coping with diminished hearing capacity to detect the signal even if they are unable to hear it. This will give your aging parent, and you, confidence that they will be able to respond properly should an issue arise in their home and they do not have someone else there to tell them what is happening and what they should do. This entry was posted in Home Health Care Bartlett TN and tagged Home Health Care Bartlett TN. Bookmark the permalink.